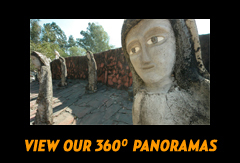 Nek Chand Foundation partnered with the Kerala Tourism Ministry to conserve and restored Nek Chand’s Rock Garden in Palakkad District in South India. Built between 1993 to 1995, the 1.5 acre garden is located on the edge of a large botanical garden and artificial lake at Malampuzha Village near the Western Ghat Mountains. Conceived as a smaller version of the great Rock Garden in Chandigarh, the Kerala Garden is Nek Chand’s only garden in South India. Because of its remote location, visitorship at the Garden has always been low, around 100 a day. In addition, lack of proper security led to widespread vandalism. As part of a comprehensive master plan for restoration, the Nek Chand Foundation sent several delegations between 2004 to 2008 to Kerala to assess the situation and develop a suitable rehabilitation plan with the Ministry of Tourism. The Foundation’s role was advisory for repair work and standards of work and international promotion of the project. Part of the Foundation’s longstanding commitment is to promoting international cooperation and education. The Foundation sent a group of five American volunteers who spent five weeks working alongside Indian colleagues and local artists during the months of October and November 2008. Nearly five dozen cement statues were cleaned and repaired along with the terraces and plazas. In addition, several new statues were also added. In order to better protect the Garden, security lights at night have also been installed and the boundary wall raised to keep out vandals. Metal grills have also been installed to prevent visitors from touching the statues. Simultaneously, the Ministry of Water and Irrigation has begun a massive renovation project to update the adjoining botanical gardens with the hopeful result of increased appreciation and visitorship for both sites. A new bus stand is also being built near the Rock Garden. In order to increase community awareness of the restoration project, newspaper articles frequently appeared in the press along with an open door policy so that visitors could see conservation in action. Nek Chand Foundation sponsored a district wide competition to design an official flag for the Garden and hosted several receptions for local government officials at which they were invited to break mosaic tiles for the mosaic work. The entire project was closely monitored by Mr. Nek Chand in Chandigarh and he kept in close contact with NCF so that the restoration was conducted according to his specific wishes. So that Kerala artists could better understand Nek Chand’s wishes and learn proper restoration techniques, the Foundation sponsored Mr. Swami Nathan and Mr. Krishnan to visit Chandigarh for two weeks of instruction with the master. Considering the complex nature of these international projects and limited economic resources available, the parties concerned are pleased with the outcome and the renewed interest in Nek Chand’s South India Rock Garden.